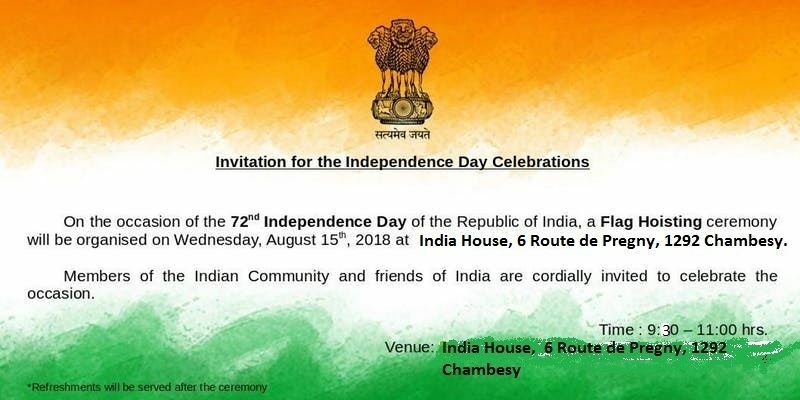 On the occasion of 72nd Independence Day, a Flag Hoisting ceremony will be organized on August 15, 2018 at 0930 Hrs at India House, 6 Route de Pregny, 1292 Chambesy. Ambassador/Permanent Representative of India to the United Nations, Shri Rajiv K. Chander will hoist the national flag. This would be followed by presentation of patriotic songs and dance by children. Light refreshments would be served after the ceremony. The invitation to attend the flag hoisting ceremony is extended to all members of Indian community and friends of India. You are requested to register using this link.